In short, the ketogenic diet kick-starts your body's metabolism, by burning fat and ketones, instead of sugar, as its primary fuel - however, most keto diets are packed with meat and dairy - which often creates a whole host of other issues - especially for those trying to get more plants and green goodness onto their plates (and less bacon). 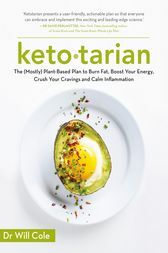 Enter Ketotarian - Dr Will Cole's revolutionary programme that offers a fresh, modern twist on keto by harnessing the same fat-burning power, but with the nutritious, delicious benefits of a mostly plant-based plate. It includes 75 recipes that are veggie, vegan and pescatarian, a four-week meal plan and lots of practical tips that will help you on your journey to optimum health, renewed energy and improved brain function. Let the Ketotarian revolution begin! Dr Will Cole graduated from Southern California University of Health Sciences in Los Angeles, California. He has his post doctorate education and training in Functional Medicine and Clinical Nutrition through The Institute for Functional Medicine and Functional Medicine University. Dr Cole consults both locally in the Pittsburgh area and via webcam consultations for people around the world. He specializes in clinically investigating underlying factors and customizing health programs for chronic conditions such as thyroid issues, autoimmune, hormonal dysfunctions, digestive disorders, diabetes, heart disease and fibromyalgia.